Emmanuel Macron’s address to a joint session of the US Congress on Wednesday was one of the most belligerent public statements ever made by a French president. 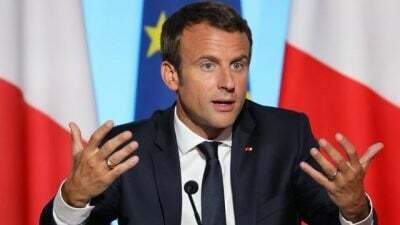 Hailing the unprovoked bombing of Syria on April 14 by Washington, London and Paris as a model for a new world order in the 21st century, Macron declared his support for US war threats against Iran, North Korea and beyond. The address capped off Macron’s three-day state visit to Washington, amid the deepest crisis of the trans-Atlantic alliance since the end of World War II. Panic is mounting in European ruling circles over US moves to slap trade tariffs on European and Chinese goods, threatening a spiral of retaliation and a global trade war, and Washington’s announced plans to cancel the Iranian nuclear treaty, threatening the eruption of war throughout the entire Middle East. Yet Macron had nothing to propose save more calls for aggressive military action, covered over with hollow bombast about the defense of democracy. Macron’s rhetoric about Washington and Paris carrying out an eternal war for democracy, which takes the form in our epoch of a “war on terror” against Islamist groups, is a pack of lies. The trade rivalries between major US and European corporations, and US-European conflicts over whether to break Europe’s economic ties with Iran and risk war in the Middle East, are not conflicts to save democracy from terrorism. They are inter-imperialist conflicts rooted, as the great 20th century Marxists explained, in the violently clashing interests of rival nationally based capitalist ruling classes. Macron proceeded to contradict his own fraudulent presentation. He appealed to Washington to drop its threats of trade war and coordinate its war policies more closely with Europe—not in order to fight terrorism, but to preserve the dominant role played in world politics by the imperialist powers against unnamed great-power rivals. Macron’s hailing of the April 14 bombing of Syria as a model for the future constitutes a warning to workers and youth internationally. Behind empty rhetoric about democracy and the rule of law, the ruling classes in the imperialist centers act ruthlessly, with utter contempt for international law, in order to assert and maintain their dominant world position against their geostrategic rivals such as China and Russia. The April 14 attack was a war crime, based on NATO lies that Assad regime forces had used chemical weapons in the city of Douma. As Moscow presented evidence that the attack was staged by the NATO-backed White Helmets militia to provide a pretext for bombings, Washington, London and Paris launched missile strikes on Syrian state buildings, preempting UN investigations of the alleged chemical attack. Macron’s praise for this attack underscores that the 21st century order he foresees would be based on endless, lawless violence by the imperialist powers. On this basis, Macron endorsed US threats against targets across Eurasia. Macron’s argument is a hypocritical fraud. On the one hand, he gave a blank check to Trump, who has threatened North Korea with “fire and fury like the world has never seen” and is backing Israeli threats of military action against Iran; on the other, he insisted that he did not support the war that flows from such policies. Then he tacked on an impotent appeal to avoid repeating “past mistakes,” that is, imperialist wars and military occupations in the Middle East over the last 25 years, without saying what these were. Following the Stalinist dissolution of the Soviet Union in 1991, the imperialist powers were freed from any effective military counterweight to their neocolonial interventions in the Middle East. A series of bloody imperialist wars in the strategic and oil-rich region—from Iraq to Afghanistan, Libya and Syria—claimed millions of lives and forced tens of millions to flee their homes. The class interests driving these wars were obscured, however, by imperialist lies that they were motivated by the need to fight terrorism and save democracy. The Big Lie of Iraqi weapons of mass destruction set the pattern for the succeeding neocolonial wars. The geopolitical crisis provoked by these decades of war is escalating into a military confrontation between the major world powers. As Russian and Iranian forces fight in Syria against NATO-backed “rebels,” and China seeks closer ties with Russia to protect itself from US threats over trade, the South China Sea and North Korea, the danger of the eruption of a war directly between major nuclear armed powers is growing. The April 14 attacks were stunningly reckless precisely because of the danger of their provoking a clash between Russian and NATO forces. The attack on workers’ living standards necessary to finance these wars is now provoking a growing fightback in the working class. Mass strikes by teachers are proceeding in the United States as rail workers strike and university students occupy their classrooms in France to protest Macron’s drastic reforms, which he has pursued despite broad popular opposition. This growth of working-class struggle is itself a major factor driving the ruling classes in both France and the US to escalate their military aggression abroad in an attempt to divert social tensions outward against a foreign “enemy” and create conditions for the use of state violence and censorship to crush opposition at home.